LOOK at the photograph very carefully. S Sundareshan, secretary, ministry of petroleum and natural gas was enjoying the moment. Look at his smile. It was an honest expression of his great feelings. 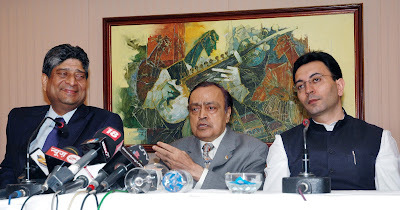 Now guess what Union petroleum minister, Murli Deora said in the conference to make his secretary so happy? You can write about your guess to feedback@babusofindia.com, or post your comment below this piece. For the record, the occasion was a press conference, after inaugurating the “NELP-IX Promotional Road Show”, in Mumbai on October 18, 2010. The senior minister looks angry and minister of state for petroleum and natural gas Jitin Prasada (Right) seems to be in a different world. He seems to be clueless. So, you need to guess what Deora must have said which made his junior minister clueless and his secretary thrilled. Seven envoys presented their credentials to the President of India Pratibha Devisingh Patil at a ceremony at Rashtrapati Bhavan on Monday. The envoys who presented their credentials were Mr Fatos Kerciku, Ambassador of Albania, Freddy Svane, Ambassador of Denmark, Khaled El Bakly, Ambassador of Egypt, Kim Joong-keun, Ambassador of Republic of Korea, Ahmed Tahsin Ahmad Berwari, Ambassador of Iraq, Andre Sanra, Ambassador of Benin and Giacomo Sanfelice di Monteforte, Ambassador of Italy. Welcoming the envoys, the President said India will contribute to global issues in a constructive manner. She also referred to the importance of co-ordinated action by the international community in economic and financial matters. Finally, the government has come out with detailed syllabus and pattern of the civil services (prelim) exam from 2011 onwards. From civil service examination 2011, preliminary examination would consist of two papers- Paper I and Paper II. For details, click HERE. For many more government jobs and openings, follow http://www.jobcorridor.com/.